Would you ride a bike on the water? Or take a bike backpacking trip? Did you even know these things were … a thing? Because I love travel and bikes, I get email that sometimes combines the two. Read on to learn about these and other cool bike ideas. 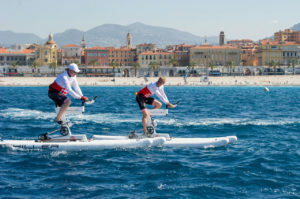 Move over Paddle boards…water bikes are on the rise. The photo above is for real. These Schiller bikes are for rent at various luxury vacation spots now…who knows in the future we might be able to ride across Tim’s Ford Lake on one of these. Paul Freedman created a new bike, a tall, bamboo, electric, cargo, adventure, tandem bike called BooLander. This fella does not own a car and uses his bike creation to haul everything…including lumber! Also, check out his Fender Blender (make your smoothie as you work out) and other human powered bike ideas! Supplier of bike lights and accessories, Planet Bike has recently awarded $24,000 to six bicycle non-profit organizations. The recipient organizations are working to provide programs that attract people to cycling and infrastructure projects to move bicycling forward across the country. If you need a new light, consider buying one from Planet Bike. This company’s ad says, “Forget what you think you know about front-loading cargo bikes; the Supermarché is like no other. The dual cable steering, extra low front rack and 90 degree steering radius makes for cargo hauling machine that steers like butter and turns heads everywhere. Bring everything AND the kitchen sink.” All I can say is these bikes are a cool way to get around. And, how about looking into going bike backpacking. That is right; carrying your gear and riding to a remote location to camp. This website is full of info, routes, and more…be prepared to get lured into the idea by the beautiful photos. Wondering about how to ease into bike backpacking without spending a lot of cash on gear; here is a way to make your own handlebar roll harness. Hope you enjoyed these cool bike ideas I learned of via email. This entry was posted in Reviews, Ride Reports, The Right Side of the Road and tagged Bikes, cargo, lights backpacking, water bike on April 19, 2018 by juliah.